AT&T Office@Hand Meetings is a Cloud Video Conferencing that unifies HD video conferencing, mobility and web meetings together as a free cloud service. Office@Hand Meetings gives you the power to video conference and web share, as part of your complete business communications solution. Hold face-to-face meetings in high definition and share your desktop or documents with anyone, anytime, anywhere. Office@Hand Meetings is available to all Office@Hand Office Editions plans. Administrators can assign themselves or assign Users to be the host of a meeting. Participants will only need to download the app to be able to join meetings. The table below lists the different number of participants among the different Office@Hand plans. Start without video – This button will allow you to start the meeting with your computer’s camera disabled. 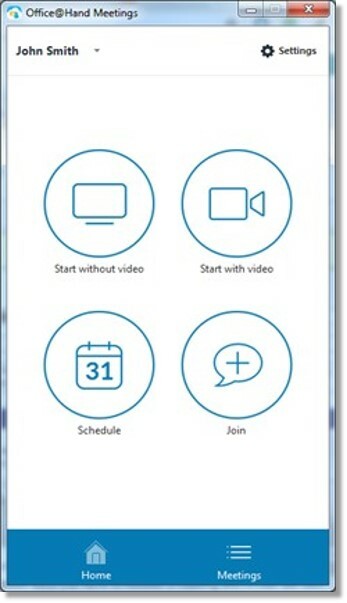 Start with video – This button will immediately start a video conference as a host. You can invite participants while the meeting is in progress. 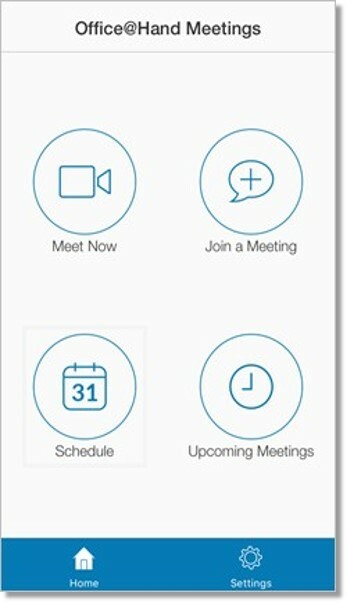 Schedule – This option will allow you to create a future meeting and send invites to participants. Join – This button will allow you to enter the Meeting ID and your name as it logs you into a meeting. Home – This option navigates you back to the app’s home page. Meetings – Takes you to the list of upcoming and previously recorded meetings. Drop down menu – Allows you to manually check for updates, pull up Office@Hands’s support site for help, log out or exit. You can also see and change your Personal Meeting ID and see your Host Key. Settings – This allows you to optimize your Meetings environment. Meet Now – This option will allow you to immediately start a meeting. Join -This option will allow you to enter the Meeting ID and your name as it logs you into a meeting. Schedule -This option will allow you to create a future meeting and send invites to participants. Upcoming – Takes you to the list of upcoming meetings. Settings – Takes you to the app’s settings page. You can see and change your Personal Meeting ID and also see the Host Key from here.